Leila Ladjevardian is what we'd call a, "True Blue supporter," here at UNICEF. Meaning she pours her heart into putting children first and encourages her peers to do the same. She speaks eloquently about the issues that affect children and lays out actionable items to anyone seeking guidance on what they can do to help. She views any conversation headed towards the realm of global development, philanthropy, or the plight of the world's children as an opportunity to empower someone to take action. Here's how she turned her passion to empower others to give back into her full time gig. Leila's first encounter with UNICEF USA began in Houston when she was just sixteen. The UNICEF Houston Gala was aging, and the committee craved the young blood that reminds everyone what UNICEF is all about: kids. The committee extended the role of “Gala Youth Chair” to Leila and her friend, Ashley Bush. It was the first time Houston invited young people to participate in the Gala and it was a massive success. The Gala Committee delegated a number of important roles to Leila and Ashley, including decisions about set up, what food would be served and what entertainment should play. In return, Leila and Ashley worked earnestly and took their appointed positions seriously. They went above and beyond – building out "youth" tables for their peers to attend and witness this celebration of UNICEF's work. This exposure was a precursor to the large scale events and activities Leila would go on to host in New York City on behalf of UNICEF. Her stint as the Gala junior-chair also emboldened her to dedicate more time to UNICEF. The next year, she set her sights on attending UNICEF's Annual Summit and General Session where she could advocate for children. When Leila arrived, she was in awe. The summit hosted hundreds of other students and UNICEF supporters that shared this passion to help kids globally and make real-world impact. Leila felt assured, once again, that this was where she was meant to be and what she was meant to be doing. So, when she settled into her freshman dorm at Georgetown, she was thrilled to further delve into global development and began working towards her B.S. in International Politics. After college, Leila started a dream job at CHANEL, but it wasn't long before her heartstrings yearned for some do-good action. Leila started shopping around New York City organizations, hoping to find something she could see herself playing a larger part in. She checked out museum programs for young professionals, the ballet and various domestic initiatives, but none pulled at her in the way UNICEF had many years ago. She was passionate about development, equity, and the rights of women and children. “I'll just see if there's anything through UNICEF,” she thought, and sure enough, UNICEF USA had just launched UNICEF NextGen, the program for young professionals to support UNICEF's work. She jumped right in and had her first meeting with Chelsea Peters, who is now the Chief of Regional Strategy and Operations at UNICEF USA. She found that the people she was meeting through this new community weren't just like-minded in their will to make an impact, but were also people she connected with on a deep, interpersonal level. One example of this came when Serena Guen met Leila through a UNICEF fundraiser. Serena was, at the time, launching Suitcase magazine from her NYU college dorm. She told Leila that she'd be moving back to London, but she wanted to take NextGen with her. NextGen went global shortly thereafter when Serena teamed up with Leila's fellow Houstonian, Layla Yarjani, and French consultant and entrepreneur, Hortense Decaux, to get NextGen London off the ground. This wasn't the only intimate connection Leila stumbled upon through NextGen. She traveled to Indonesia on a UNICEF field visit, where they saw UNICEF Staff administer Polio vaccinations, and visited UNICEF supported hospitals. Upon her arrival, she found that another NextGen leader on the trip was her old high school friend, Kelly Wilson. "NextGen naturally reconnects you to people that you couldn't ever imagine being part of your life, but you're so glad they came full circle, because these are the people who share your drive." Leila's experience in the field changed everything, as it does for many supporters. As she recalls, she was already "fully in," but after coming back, she approached her event and her work with UNICEF with new fervor, sharing that, "All the time and energy you put into planning events and asking people for donations suddenly translates to the people you met, the children you played with, the human lives UNICEF will work around the clock to reach if we can just provide them with the funds to do so." She could now recount human stories and share, in vivid detail, the programs UNICEF is implementing on the ground. People became even more captivated by the cause Leila conveyed. She remembers feeling like this was her community; NextGen people were her people. She even remembers telling others, "NextGen members haven’t just become my friends, they're global leaders, and they're the type of people who could be my potential business partners!" Ironically enough, Leila began to apply to business school soon thereafter. She completed her MBA from Columbia in 2016 and moved to London to work with Goldman Sachs. It wasn’t long before her magnanimous vocation made a reappearance. Markedly, Leila's arsenal is laden with a diverse set of skills and achievements in a variety of industries. While her philanthropy work always ran parallel to each endeavor she pursued, she recently found a way to make this passion her full time gig with her latest venture, FuLL Impact Advisory. I had the opportunity to Skype Leila and hear more about the founding of this company. The first thing she said was that nothing has ever felt more natural. She laughed as she remembered just how many people were convinced she was a full time UNICEF employee. 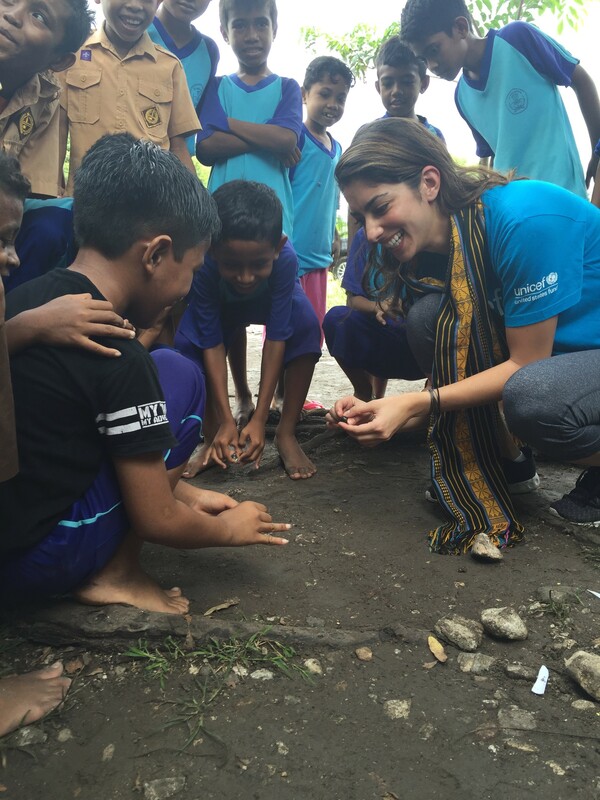 "People genuinely thought I worked for UNICEF because it was my passion--it was my life! So, they'd come to me with their altruistic dreams and ask me how best they could actualize them. I loved diving into the charity-realm to see who they could benefit and how they could ensure their donation was cost-effective and sustainable." Last year, when the famous soccer player and French world cup winner of 1998, Youri Djorkaeff, brought an idea to Leila, with the hope that she could turn his dream into a reality, she did just that. The framework of what Youri wanted to accomplish was clear, but the non-profit space was utterly new territory to him, and he didn't know where to begin to make the largest impact. Leila sat down with Youri and his team to better understand their goals. She learned that they wanted to help Syrian refugee children in Greece, and they wanted to do this through sports development. She conducted extensive market research, and reached out to multiple organizations, but once again, her orbit's path led her directly to UNICEF for what seemed like a perfect fit. UNICEF and the Organization Earth (the local implementing partner) would construct and launch a ten week soccer program aimed at providing Syrian refugee children with the opportunity to improve their mental health and physical education through sports development. She facilitated a plan that included a field visit to Greece so the Djorkaeff Foundation could see and take part of the very program that they had launched, and organized a press conference which strategically allowed her clients' the opportunity to meet with a number of larger local non-profit organizations (i.e. Stavros Niarchos Foundation) to discuss potential partnerships. No matter what your passion is, there is more we can all be doing in our daily lives to seek it out. It is change-makers like Leila--who sports an enviable glint in her eyes--that reminds us just how much of a rush it is to not only find it, but to commit to it. If you can't go all in and start your own philanthropy consulting company like Leila, UNICEF NextGen is here for you in the meantime, to make ‘doing good’ your side hustle.